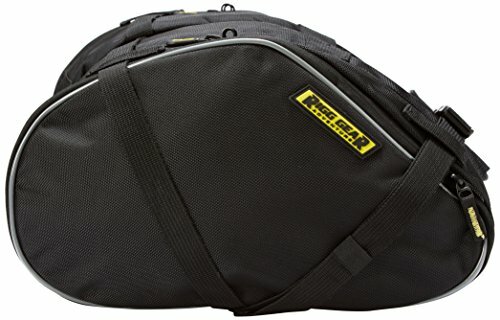 Made from top quality UV treated and water resistant 1680D Tri-Max Ballistic nylon with reflective piping and accent for nighttime visibility, the RG-020 Dual Sport Motorcycle Saddlebags are perfect for most Adventure, Dual-Sport, and Enduro motorcycles. Features an expandable main compartment for extra storage, a tool pouch/pocket under main compartment with external access, with reverse coil zippers to help keep out dust and dirt, and rubber coated oversized zip pullers for easy operation with gloves. Securely mounts with heavy duty Self-Fastening straps and quick release buckles with an anti-slip/scratch protective panel to keep your paint/plastics looking great. Product Dimensions: 14.5"L x 9"W x 6"D/Expanded: 14.5"L x 9"W x 8"D. Holds 12 liters per side/15 liters Expanded per side.